Tizimín is a city located in the Tizimín Municipality in the Mexican state of Yucatán, It is located in the Coastal Zone of the same state. Church of the Three Kings of Tizimín. It has an average height of 20 meters and is located at a distance of 1,492 km from Mexico City, 167 km from state capital city, Merida, Yucatan, 54 km from Rio Lagartos, 50 km from Valladolid, Yucatan, 36 km from Ek' Balam and 27 km from Espita. The city is known for its traditional fair of the Biblical Magi, celebrated in late December and early January. It is also a major Mexican handcraft market selling rebozos, huipils, tablecloths, jewelry and guayaberas. This fair gives the city its nickname of "King's City". 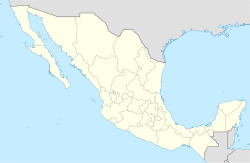 In 2010 was the second largest city in population of the eastern Yucatan, only after Valladolid, Yucatán. It was also the third largest city and fourth largest by number of people around the state. Currently is the leading producer of beef cattle in the state of Yucatan, and is the central urban service provider the northeastern region of the state. Tizimín has one sister city since 2011, the city is Evansville, Indiana in the United States. The city is served by the Cupul National Airport (IATA: TZM). ^ Radio Mayab. "Crece la obra pública en la Ciudad de Reyes". Archived from the original on March 8, 2016. Retrieved September 27, 2011. ^ IPEPAC. "Directorio de alcaldes electos" (PDF). Archived from the original (PDF) on September 16, 2011. Retrieved October 15, 2011. ^ IPEPAC. "Alcaldías de Yucatán por partido político" (PDF). Archived from the original (PDF) on July 22, 2011. Retrieved October 15, 2011. ^ a b Instituto Nacional de Estadística y Geografía (2010). "Principales resultados por localidad 2010 (ITER)". ^ Servicio Postal Mexicano. "Consulta Códigos Postales". Retrieved August 2, 2011. ^ Telmex. "Claves LADA". Archived from the original on August 7, 2011. Retrieved August 2, 2011. ^ Secretaría de Comunicaciones y Transportes. "Rutas punto a punto". Retrieved October 15, 2011. ^ "Las 100 Fiestas más importantes de México". Dónde Ir de Viaje magazine. Mexico City: RR Donnelley of Mexico: 10. December 2010. ^ Universidad Autónoma de Yucatán. "Eficiencia Económica de los Sistemas de Producción de Carne Bovina en el Municipio de Tizimín, Yucatán, México" (PDF). p. 80. Archived from the original (PDF) on October 16, 2012. Retrieved October 15, 2011. ^ Secretaría de Desarrollo Humano y Medio Ambiente. "Jerarquización de los Asentamientos Humanos y Sistemas Urbanos en la Región Noreste del Estado de Yucatán, 2008" (PDF). Retrieved October 15, 2011. ^ NORMALES CLIMATOLÓGICAS 1971-2000 Archived 2012-06-28 at Archive.today, National Meteorological Service of Mexico. Retrieved July 31, 2012 . ^ Diario Respuesta (May 22, 2011). "Firma hermanamiento Evansville con Tizimín". Archived from the original on April 25, 2012. Retrieved July 6, 2011. ^ News25.us (May 16, 2011). "Evansville and Tizimin, Mexico Become Sister Cities". Retrieved July 6, 2011. ^ yucatanalminuto.com (May 23, 2011). "Evansville es ciudad hermana de Tizimin". Retrieved July 6, 2011. Wikimedia Commons has media related to Tizimín. Yucatan.gob.mx - Official website of the State of Yucatan. Tizimín.gob.mx - Official website of the city.